It’s being billed as Van Halen’s Monsters of Rock. Fine and dandy. But if it weren’t for “special guests” Scorpions, the five-band rock show that hits Seattle this Wednesday (July 27) wouldn’t be nearly as monstrous. With such mediocre acts as Dokken and Zep-clones Kingdom Come on the bill, you need a real band like the Scorps to show them who’s boss. There’s even the possibility that Germany’s top hard-rock band will blow Eddie and the boys off stage. I passed that thought on to lead singer Klaus Meine when he called the Georgia Straight from Minneapolis last week. Meine and his bandmates have good reason to be grinning these days. Their latest album, Savage Amusement, has eclipsed the platinum mark in both Canada and the U.S. after only a few months. And the 29-date Monsters tour is the perfect vehicle to push sales of the record right over the top. Klaus says they’re enjoying the tour too. No doubt. Still, there has been a lot of talk in the music industry press about how the Monsters of Rock hasn’t been attracting the huge audiences originally expected, and how some promoters have lost their shirts in a few cities. Klaus agrees that there have been problems filling some of the stadiums along the way. The Scorpions start their own tour in Tucson, Arizona when the Monsters gig is over, and Klaus says chances are good they’ll be making it up to Canada later this year (keep your fingers crossed). Local Scorps fans will surely be ready for them, since it’s been four long years since their last tour, in support of the ’84 release Love at First Sting. So what took them so long to get their next studio album in the racks? “We checked out the beaches in the world,” says Klaus. “No, not really. But after touring the world with Love at First Sting for 15 months or something, it was time to reload the batteries. Then we did some big outdoor festivals in the fall of ’85 in [North] America, and in ’86 we were headlining the Monsters of Rock all over Europe with such a great package as Bon Jovi, Def Leppard, and Ozzy Osbourne on the bill. So…the world is big! There were many places we went to and a lot of things we did in the meantime. And in between we were writing these songs. We went in the studio in the fall of ’86, and spent most of last year in there as well. They sure have. And bands have come and gone. But not the Scorps. And neither have their intense, melodic tunes. The new album is far from being a concept album, but it does have one underlying theme, as evidenced by such titles as “Love On the Run”, “Believe in Love”, and “Rhythm of Love”. Sounds okay to me. I’ll take tunes about enjoying life over the doom-and-gloom stuff any day. And so, it seems, will rock fans in Russia, where last April the band played 10 sold-out shows before 15,000 people a night. The German rockers invaded Leningrad and, according to Klaus, took no prisoners at all. 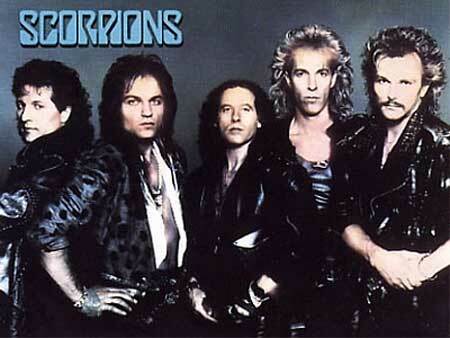 The Scorpions were one of the first major rock bands to ever play inside Russia. Billy Joel beat them to it, of course, but as Klaus correctly points out, that doesn’t count for much. Joel’s flag-waving patriotism was shunned in favour of the Scorps’ cranked up guitars–and guess which one is more effective. The Scorps even invited their back-up band from Moscow, a group called Gorky Park, to join them onstage for the last show. “It was like the first time in history that a German and Russian band hit the stage and played some rock ‘n’ roll tunes together–like ‘Blue Suede Shoes’ and stuff. ← Pink Floyd’s best-of collection A Foot in the Door gets vinyl release, ringing alarm clocks and all!